Bill and I had a great time doing this route. You couldn’t have a more perfect time out. It was sunny and warm, and two old friends were alone at the cliff for most of the route. A couple of Canadians showed up to do PT as I was belaying Bill up the second pitch, other than that it was quiet. Really just a perfect session. Having done the second ascent of “Stingray” years earlier it allowed me to ponder and compare the two fine lines. This new line was similar in some ways. The first pitch a little longer, and began and stayed steep the entire length of the pitch. They both have a side-foot rest a third of the way up, but “Stingray” has a bolted rappel anchor to clip at that point. The upper pitch of “Stingray” is more mellow without the exciting moves over rock and on to steep thin, hanging ice. This is a fine line, one of the best routes I’ve climbed, anywhere. I’ve seen this thing try to come down on several occasions, but never saw it get to the ground. Bill Simes and I headed over and went in for a closer look. It seemed almost too good to be true, it even looked like it might take some stubbies. I headed up with a light rock rack and a few screws. The ice was good, a little soft, but good climbing. There was a spot about a third of the way up to get a foot sideways, and try to fish for some gear in a seam. The seam didn’t pan out, but I left a TCU there anyway, it was about as useful as a Christmas ornament, but I lightened my load by a fraction. The last two thirds of the long first pitch were steep. The ice still climbed well, but would thin out in spots putting forward progress in doubt here and there. Roughly 5-10 feet from the end of the pitch I was able to place a 10cm screw, though the ice was a little soft for it to inspire. Once on the ledge a short,15 foot, insecure, snowy traverse right brought me to a rock corner system. A four piece, less than perfect anchor and Bill was on his way up. 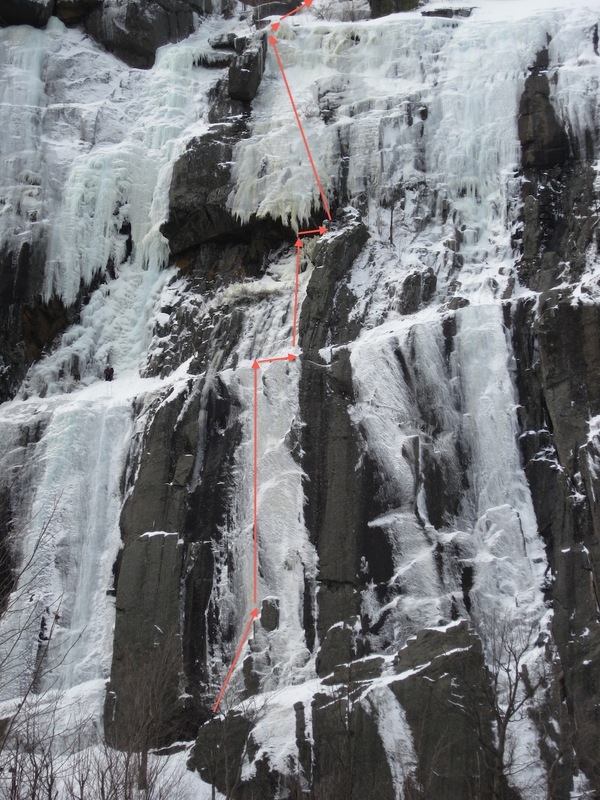 Pitch 2 starts with thinly ice rock at a roughly 3+ angle. Forty feet of that and I reached the over hang and got some good rock gear. An M fun rock traverse right and the most eligible hanger becomes obvious. Some thinly ice/mixed moves allow a committing launch onto the thin, but stable ice. Ten more feet of steep climbing leads to casual, beautifully exposed grade 4- ice that gets less steep as you climb higher. 70 meters isn’t enough, and an ice screw anchor is necessary. One more grade 3+ pitch, which lessens as it goes, gets you to the top. 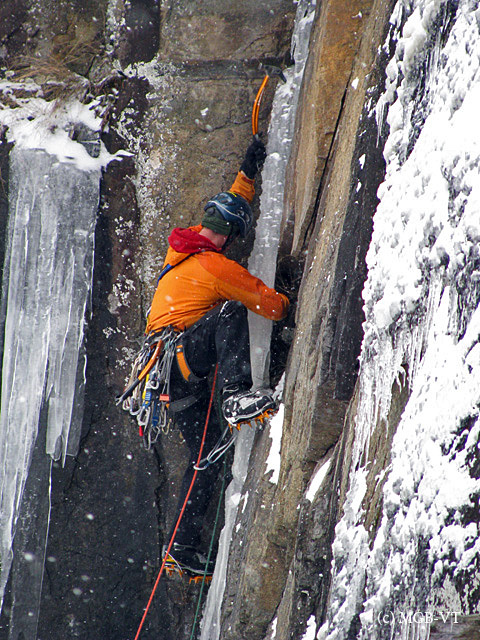 Mike Rawdon leading up "The White Fang", at Underwood Canyon, Adirondacks, N.Y. The route offered a spicey start for the given grade of, yup, 4+. hmmm? Another photo of White Fang: Mike R. checking out the start. Not for everyone. Looking up the fang.Looks steep! 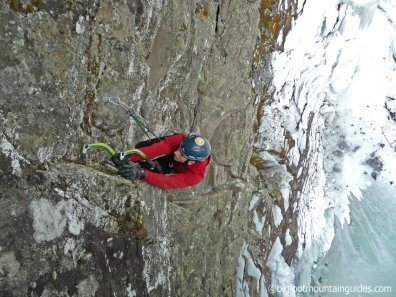 -Nearing the end of the season is a bittersweet time as we get psyched for all the hard climbing being done when fitness levels reach a peak for many climbers just as the ice starts to bake in the longer, sunny days toward springtime. Seek out those north-facing flows for safer days. Also, don’t forget, it’s this time of year when an awesome day of plastic ice in the morning and sunny rock in the afternoon can be done for a special two-fer day out. Things are hot down in Southwestern Pennsylvania lately too… and we’re not talking about the temps! Check out Ian Austin’s steep new route,“Double-A” which the duo have given a WI6. “On my first attempt of the day on the new route I made it all the way to the ice before elbowing my ice tool out of a hook while clipping! AAAHHHH! I couldn’t believe it. I had the route in the bag only to knock my own tool off the route! After climbing 90+ feet of drytooling to get there it was hard to motivate to get back on but I rallied and sent on the next try. After pulling onto the icicle I moved above the attachment point and fired in a screw about 3/4 of the way when a high powered stream of water cam shooting out the back of the screw! I had never had this happen to me and was startling to say the least. I moved quickly to avoid being totally drenched and climbed to the trees to top out the line” – Matt McCormick. 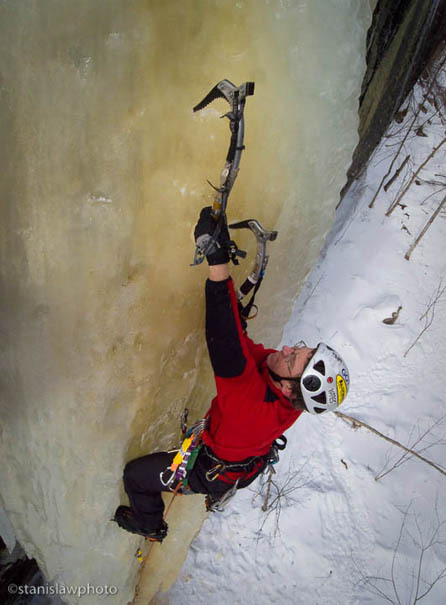 This has been a good year for ice in the Catskills and the Catskills hold some of the best ice climbing in the Northeast. Visit Ryan’s web site for a sample of the great climbing this area has to offer. 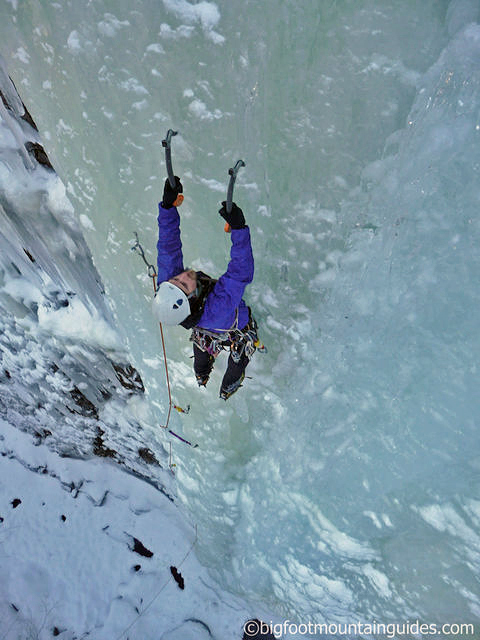 Learn all the skills and techniques you need to get out on the ice – Clinics range from basic skills, to dry-tooling, to glacier travel. Sign up on-line, or at Rock & Snow 44 Main St, New Paltz, NY 12561. Phone 845.255.1311. The Bivy has been overtaken by the ever expanding influence of technology. The Bivy now has cell service, 3 bars! What will this mean? Only time will tell. The North Face of Gothics, Grand Central on Marcy and Colden’s Trap Dike in a day. My decision to try the “Trilogy” was made on a Sunday afternoon, March 15th. Inspired by recent link-up activity in the Northeast (Alan Cattabriga’s Trifecta in NH and Joe Szot’s Adirondack Trilogy), I decided that conditions wouldn’t get any better for my own attempt at the Trilogy. This link-up starts on the North Face of Gothics and continues up and over Saddleback, Basin, and the shoulder of Little Haystack, dropping into Panther Gorge, ascending a line called Grand Central to the summit of Marcy, down Marcy, into Avalanche Lake, up Colden’s Trap Dike, down the backside and out. I started this adventure at 4:30am on Monday morning (March 16th) with a two-mile uphill bike ride from Keene Valley to the Garden trailhead (having dropped my car at the Adirondack Loj the night before, I didn’t want to ask anyone to drive me anywhere at 4am). I started the actual Trilogy at 5:02am and was determined to ski as much as possible, as I had opted not to bring snowshoes and hate walking in crampons. The first mile and a half was slow going and I probably took my skis on and off fifteen times to cross large patches of bare ground or ice. Eventually the snow became more consistent and I was able to move quickly, reaching the base of the North Face at first light. Choosing a line to the far right on the North Face allowed a straightforward ascent to the summit, which I reached at 8:30am. Little did I know, the difficult part of the day was only just beginning; having never been on this section of the Range Trail, I was under the impression that I would be following a ridgeline all the way to Little Haystack. Wrong! In fact, this section of trail descends and ascends each of those peaks and includes a section of steep, open rock that seemed to be in the range of 3rd or 4th class climbing (at least in ski boots and crampons). In addition to now feeling very sluggish in the legs, this down-climb had slowed the pace significantly. I continued plodding toward Little Haystack, skiing sections on occasion, but mostly walking (skis on my back) on packed trail, all while snagging the skis on every overhead branch and limb, wasting energy climbing over and under downed trees. At last I started to get views of Marcy’s impressive south face and the remote Panther Gorge below. Having never been on this section of trail, let alone anywhere near Panther Gorge, I knew my only hope of getting in there would be following the tracks of Joe and his partner, four days prior. Sure enough, just past the Slant Rock/Marcy Trail intersection, I spotted a faint set of tracks heading into the Gorge. I nervously followed the tracks (these guys had wisely put snowshoes on for this section) down into the abyss of Panther Gorge. Almost immediately, I lost their trail and started desperately postholing. Panicked and exhausted by dropping into waist deep spruce holes (for more than 45 minutes at this point), I started to regret bringing skis instead of snowshoes. The skis caught on everything and what branches they didn’t break, they instead shook thousands of pine needles down my back. I knew turning around and postholing out would be more difficult than what I’d just come through, so I made the conscious decision to continue, hoping to make it to some feature that would take me up and out to the relatively open slopes of Marcy’s south face. Only minutes later, I regained Joe’s tracks (and the greatest sense of relief ever! ), and followed them up a short, steep step into the Grand Central gully. The sunny, openness of this snow gully was fantastic, but my legs were now so tired that I was reduced to taking 50 steps followed by 30-second rests. I had also long since run out of water and had been forced to fill a water bottle from a dripping icicle; I did treat the water but probably not for long enough… hopefully I won’t have giardia next week! I reached the summit of Mt. Marcy at about 3:30pm. Sadly, somewhere in my Panther Gorge struggle, my watch had set itself back an entire hour, leading me to believe it was 2:30pm at the summit. Suspicious of the sun’s location in the sky, I checked my cell phone and discovered the mistake. Feeling pressured for time, I put my skis on and immediately started my descent on the Marcy ski trail. It should be noted that Joe’s descent from the summit of Marcy took the Feldspar/Lake Tear trail down to Lake Colden, whereas my descent (because I chose to ski) took me down to Marcy Dam (a mere two miles from my car), in approximately 35 minutes. From here I headed back up into Avalanche Lake and, for the first time in the day, felt so happy to have skis, which were faster and allowed my legs some recovery time. I reached the base of the Trap Dike at about 5:15pm and because of its western aspect, the sun beating down was warm and bright as if it were noon. I took a quick break here to eat some sugar-laden, caffeine-laced snacks, and I started back uphill again with a second wind. Tired of listening to my heart race, I pulled out the ipod to get through the last tedious section of the Trilogy, and was spurred along by such motivational classics as Eye of the Tiger and The Final Countdown. Despite this, my legs were so tired that I had been further reduced to 10 steps followed by 30-second rests. I reached Mt. Colden’s summit at about 7:15pm, just as the sun was setting. Fear of missing the Lake Arnold trail off Colden’s summit in the dark, made me move quickly and I reached Lake Arnold before I needed my headlamp. From this point, I was able to ski the snowshoe trench out to Marcy Dam and from the Dam to the Loj, reaching the parking lot at 8:44pm. 15 hours, 42 minutes, my final time (unless I’ve done the math wrong, which wouldn’t be surprising). I went into this with low expectations, never trying to be faster than Joe, only hoping to finish at all. I like to remind myself that this Trilogy was never my vision only something that seemed like a good challenge. I believe that conditions couldn’t have been better and having a track to follow was indispensable. While I may not be at my fittest, an extensive endurance background did finally pay off. And, when Jan Wellford recovers from a broken pelvis, you can bet that my time will be crushed as well!